Today I heard about Cathrine Couling and her company CatkinJane for the first time. That in itself is no good reason for a blog post, but I'm a big supporter of craftsmanship and that is what Cathrine stands for. I also believe small businesses like hers enrich society and are worth supporting. In her own words, she comes from a family of stitchers with both her mother and grandmother having been involved in tailoring on a private and professional basis. Cathrine carries on this family tradition when producing her own designs from the workroom in her own home. 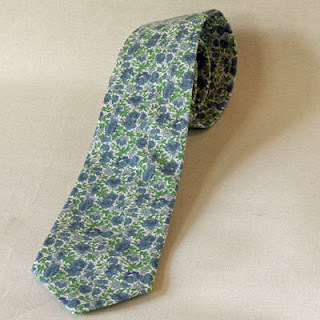 Admittedly, most of her products are aimed at a female audience, but she has a collection of ties which I think could look rather nice with a plain coloured suit and shirt. The floral patterns would bring life to an otherwise calm outfit and if that's what you're after, have a look at the CatkinJane web site. 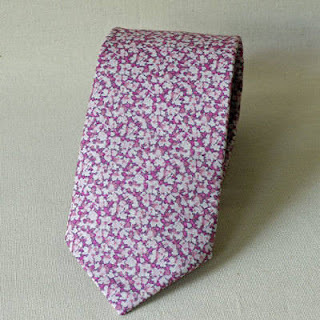 Two examples of her ties are shown below (the photos are taken from the CatkinJane web site).